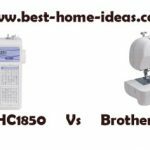 Brother CE8080PRW is a moderately recommended sewing machine. 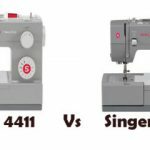 Performance wise, it is right up there with the best, but it lacks some features to be called as a computerized sewing machine. First things first, not a lot of CE8080PRW new machines are not available in stores right now. Most of them are refurbished or used ones. If that is the case I really don’t recommend buying it, because it may cause some trouble. This machine is a Project Runway limited edition model. Project Runway branding is some sort of a marketing gimmick to be honest. Brother CE8080PRW is a computerized sewing machine (not literally). This is an 80 stitch sewing machine with 120 stitch functions. 80 built-in stitches also include 8 one-step buttonholes and quilting stitches. The LCD screen does seem old fashioned but it is nice. It is where you can view all the stitch settings like stitch length and which presser foot to use etc etc. The screen is not backlit, so some people might have some trouble reading it. The machine has a built-in removable storage compartment, which is not huge but it is good enough for storing most of your accessories. It is not actually a compartment, there is a bag to fill your accessories with and you put it in the tray and slide it back. The stitch length and width adjustments can be done using the ‘+’ and ‘-‘ buttons right next to the LCD screen (optimal stitch length and width is automatically set). The stitch width can be set up to 7mm and stitch length up to 5mm. A backstitching button is provided to secure the stitch at the beginning and the end. The thread tension on CE8080PRW needs to be adjusted manually. However you really don’t need to adjust it for the most part. This machine does feature an automatic needle threader, but it may take couple of attempts to get the hang of it. The bobbin is drop-in type, which is a huge help, a real time saver. Changing the presser foot is also very easy as it snaps on and off quite easily. There is a drop feed option for doing free motion sewing. The machine is capable of free arm sewing as well. Brother CE8080PRW has a decent sewing light on-board. It does give you a good view of your work area. It is not the brightest light in the world though. 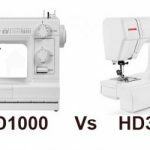 The machine has a motor capable of stitching at a speed of 850 stitches/min.Brother CE8080PRW weighs 10.58 lbs, which is definitely on the lighter side. 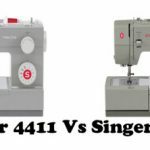 So it is very portable, a factor that you must consider if you are planning to take it to sewing classes. The machine comes with a lot of accessory feet which in other cases have to buy separately. The included feet are Buttonhole foot, Zipper foot, Button sewing foot, Overcastting foot, Blind stitch foot, Monogramming foot and ZigZag Presser Foot. Brother CE8080PRW does bring a positive feeling towards sewing. The tension seems perfect right out of the box. There are no serious issues like jamming or needle breaking. Making buttonholes can never get easier. Brother machines always had well written user manuals, this too has a detailed one which is very easy to understand. This has to be one of the easiest machines to thread. The clear cover for bobbin is very useful as you can see how much thread is left. The operation of the machine is very smooth and quiet. The stitch quality is consistent without any skipping or tension issues. This machine is quite good for quilting but the throat is not spacious enough to accommodate large projects. I was able to sew through multiple layers of denim quite easily. The main limitation of Brother CE8080PRW is that it is not a fully computerized machine. It lacks the start/stop button and speed control slider. This makes the machine slightly old fashioned. You need to use the foot pedal to control the sewing speed. The machine does not include any sort of cover. There is no hard cover or a dust cover, which I think is not really cool. You will have some trouble finding a hard cover that fits this machine. Commonly available hard covers including the Brother 5300 universal carrying case is too big for this machine. The performance of Brother CE8080PRW is right up there with the best. There aren’t many negative feedback about this machine. But it is not a fully computerized sewing machine. 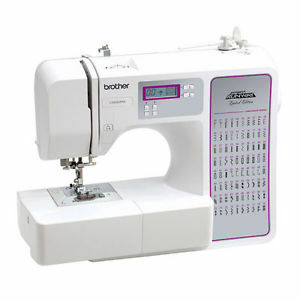 So an alternative model I can suggest is the Brother XR9500PRW which has 100 built-in stitches and comes with a large quilting table. What CE8080PRW lacks in features is addressed in XR9500PRW. 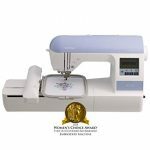 Moreover, it has been voted as the “Best Sewing Machine For The Money – Under $200” by Sewing Machine Reviews.